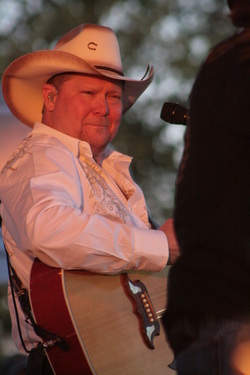 For whatever reason, there is considerable speculation as to why Tracy Lawrence recorded this particular album at this point in his career and why he chose the songs he chose. My response to all those curious minds who want to know is; who cares? The album is a pure delight from start to finish. Folks are also speculating that this album is an attempt to "cross over to the Christian market." Again, my only response is the same, "who cares?" Hello! Just hearing Lawrence sing is a religious experience; where have all you doubters and nay sayers been all these years? Obviously, you've never heard him sing before and despite the fact that this album may be listed predominately as "Christian" or "Gospel," and fits comfortably in both of those categories, it shouldn't be excluded from other categories or genres. The Rock is such an easy listen from start to finish. It's uplifting, enjoyable, encouraging, soothing, relatable... come on now, aren't these keywords for all good "country" music? When was the last time you didn't want to listen to inspiring lyrics delivered as smoothly as a shot of great Tennessee whiskey? And did I mention the excellent musicians on these tracks and the wonderful musical harmonies that support Lawrence on several cuts. I guess I'm being a bit redundant but I just don't want folks to pass on this album because they think they are going to get preached to. This album isn't like that at all, well, however, on the other hand, it may invoke a religious experience. The title cut is about the history of a small church "outside Savannah" but Lawrence could be singing about any house of worship anywhere and I immediately thought that "The Rock" was a metaphor for where Jesus was actually crucified. Alright now, don't panic. I'm not going to get all preachy and religious; let's move on. I will admit that "Jesus, Come Talk to Your Children," is pure gospel but it is gospel with great guitar riffs. Honest. It will definitely get your inner soul rocking and perhaps your outer soul as well. I really enjoyed "The Book You Never Read" with its inspiring lyrics, strong instrumentals and motivating message. It may be my favorite track but I'm not sure 'cause there isn't a bad cut on the album so it is truly difficult to choose a favorite. "I Know Where Heaven Is" is a song that everyone can relate to and, once again, there is some really wonderful steel guitar playing to get you moving. Same can be said of "I'm Done" only on this track, it is the banjo that will keep you tapping your foot. The final cut, "Say a Prayer" is a melodic cut and its message is absolutely, splendidly delivered. It is an appropriate ending to this wonderful musical montage and the instrumentals are as soothing as Lawrence's amazing vocals. After listening to the entire album, several times, I can honestly say that I totally enjoyed every single song and I never once felt preached to. However, for all of you out there who will still claim this is a gospel album, let me yell out an enthusiastic "hallelujah!" and for the others who will still pigeon-hole this as a Christina album, well, then I have only one final thing to say, "Amen." Having said that, I'm confident that any cut from this album would be at home in any genre of music and I think it is one of the best album's Lawrence has ever done and, believe me, I love them all.